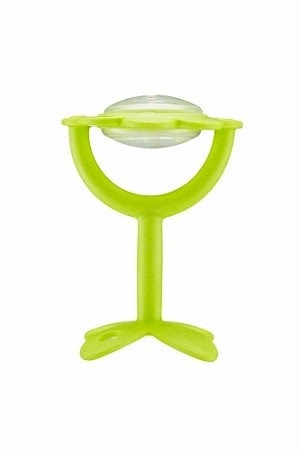 Top Notch Material: Innobaby Offers the Best Teethers and Baby Food Storage Containers Around! Innobaby Offers the Best Teethers and Baby Food Storage Containers Around! I first discovered Innobaby in my Citrus Lane box. 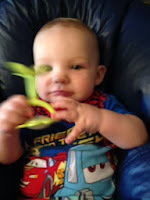 Months ago they sent me the ez grip teether from Innobaby and my son loves it. I went out of my way to contact Citrus Lane and find out who made it because I threw out the packaging before I knew how much my little man loved it! Since we are such huge fans I decided to contact them about a review. I was very lucky when they sent me Keepin' Fresh Double Insulated Stainless Bento/Alligator as well as ez grip Massaging Teether & Rattle. You might wonder what makes the Ez Grip teethers so much better than others. I am gonna say it is the super soft flexible material it is made of. He also loves that they fit perfectly in his little fist so he can easily get it to his mouth. Both the teether and the teether rattle combo massages the gums and the unique shape helps with fine motor skills and coordination. IF I have more babies, these are definitely at top of my list as MUST HAVES! Another fabulous feature is that both are top rack dishwasher safe! The whole thing is dishwasher safe, although it is recommended handwashing this for prolonged use, though the stainless is completely dishwasher safe. Another awesome thing I learned was that this is great for freezing portions- you just have to make sure that you only fill it 2/3 full to make room for expansion. I definitely plan to do lots more shopping at Innobaby. 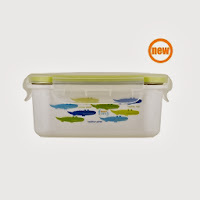 With all sorts of food storage containers- that are quality made, I highly recommed them to anyone. Make sure you like them on facebook to stay up to date on the latest products and promotions.